RobOlympics - National TalentS Co.
RobOlympics is an interactive learning program that engages participants through a short duration competition. 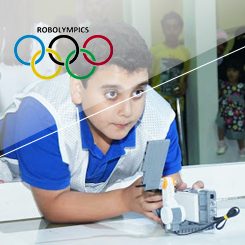 RobOlympics is designed to spark kids’ interest in robotics and engineering through an exciting hands-on journey. A competition takes place every hour for a specific robotics game that imitates an Olympic game in real life like: Football, Race, Golf, Gymnast, Weightlifting, Sumo, Billiard and Shot-put. Youth are able to compare their scores to the overall score since day one. This excited students to come back and participate over and over again to maintain their high record, or to break other existing records. The games were selected to allow for short preparation time and quick accomplishments. These robots are designed to capture a child’s imagination like no other tool by creating a fun, physical learning process. Robotics is a great way to get kids excited about science, technology, engineering, and math (STEM) topics. Studies show that it is highly effective in developing team-work and self-confidence in youth.